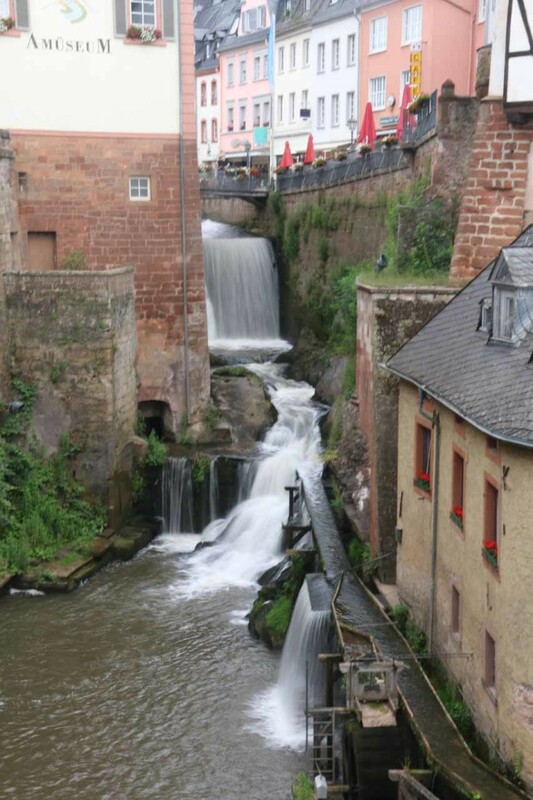 The Saarburg Waterfall was a charming urban waterfall spilling within the old town (altstadt) of the medieval city of Saarburg. 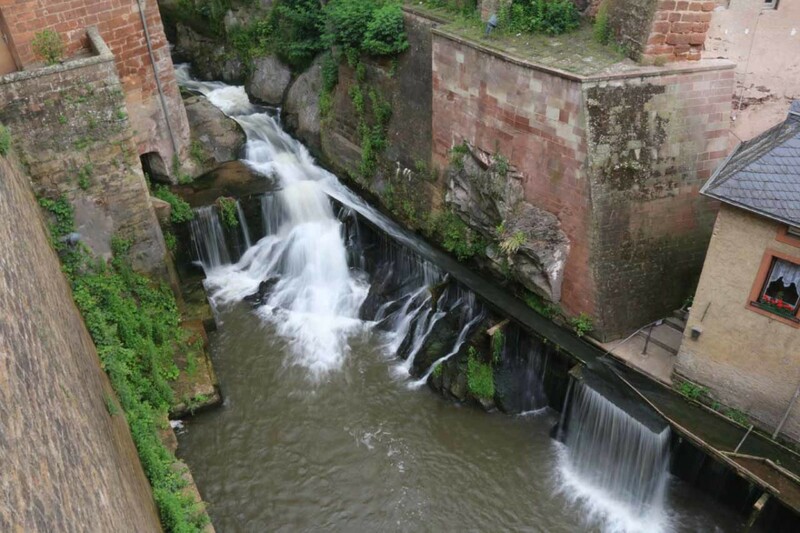 While we tend to have negative perceptions of urbanized man-modified waterfalls, the developed surroundings actually added a bit of charm and atmosphere to the overall experience. 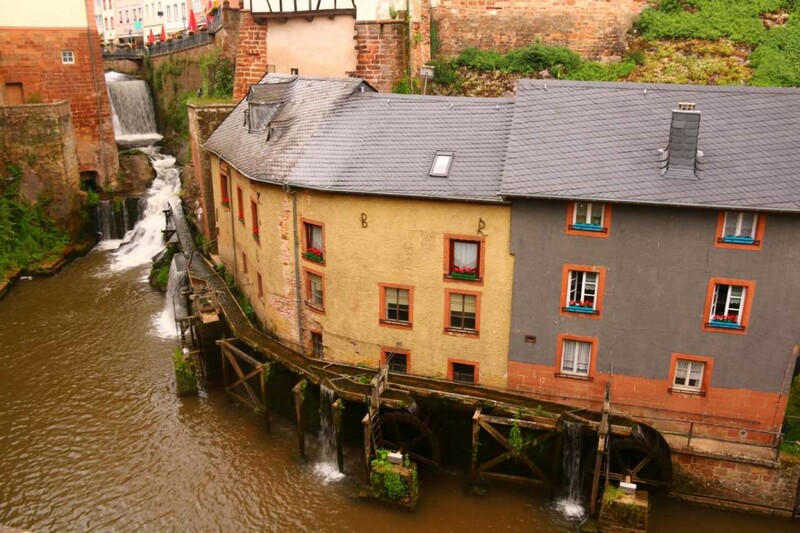 For starters, the waterfall was flanked by historical buildings including a water mill that diverted some of the water at the base of the falls to a waterwheel. 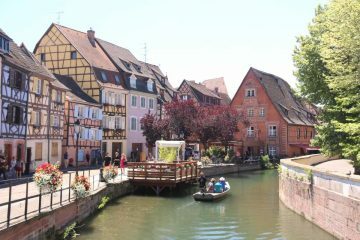 The buildings were made in the traditional half-timbered style that really amped up the cuteness and charm factor. 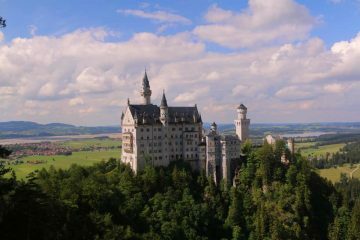 Such architectural styles seemed prevalent in all the German speaking countries we’ve visited so far (namely Germany, Austria, and Switzerland). 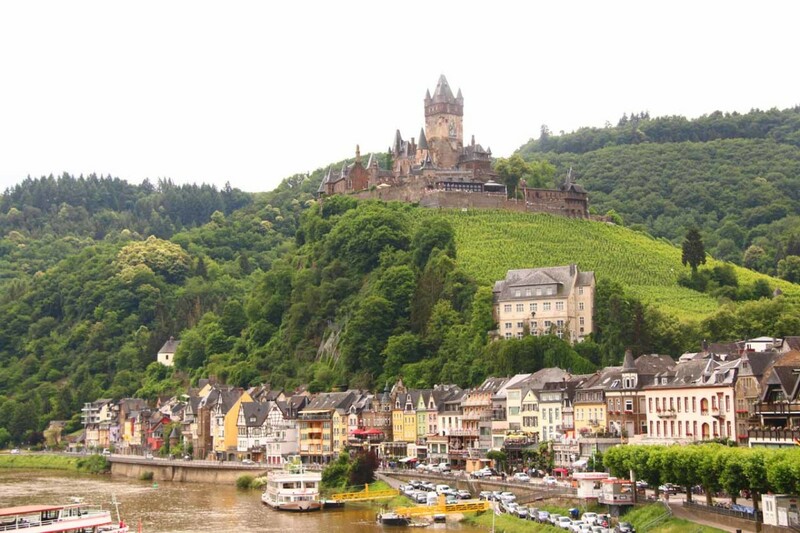 As for the waterfall itself, it spilled over 60ft on the Leuk Stream (Leukbach) before joining the Saar River, which ultimately joined up with the famed Mosel River (or Moselle in French) further downstream. 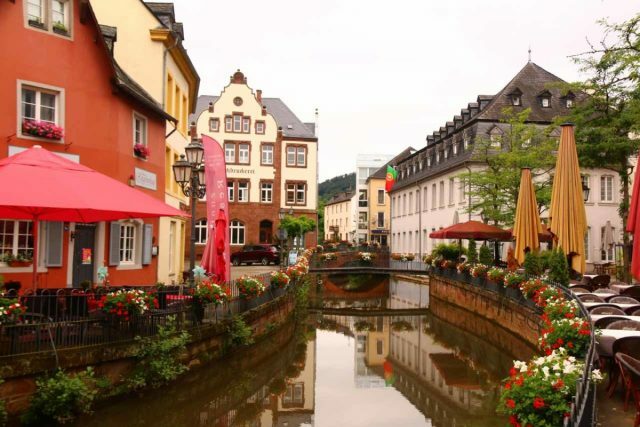 The Leukbach was said to be channeled through the Saarburg City Center as a result of a 13th century project, which thereby resulted in the creation of the Saarburg Waterfall. 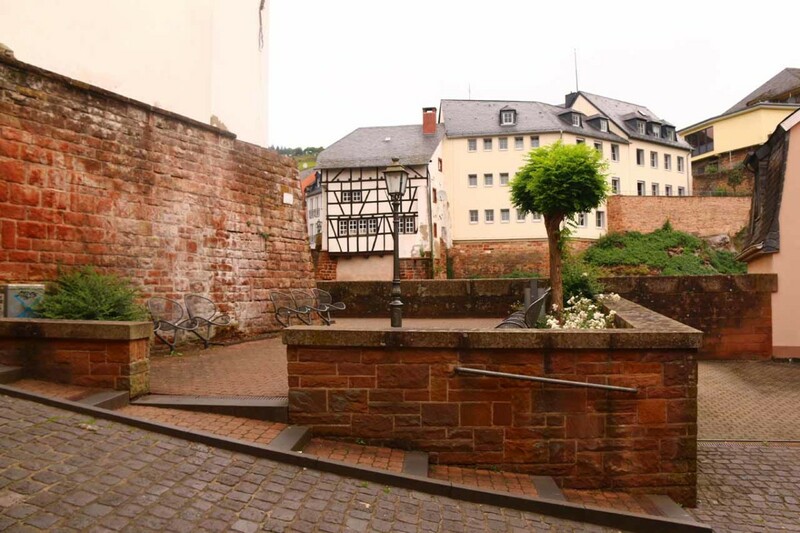 While there were many ways to reach the Saarburg Waterfall after leaving the car at one of several car parks in and around town, we’ll describe our walking route from the car park that was near the Alt (Old) Saarburg (see directions below). 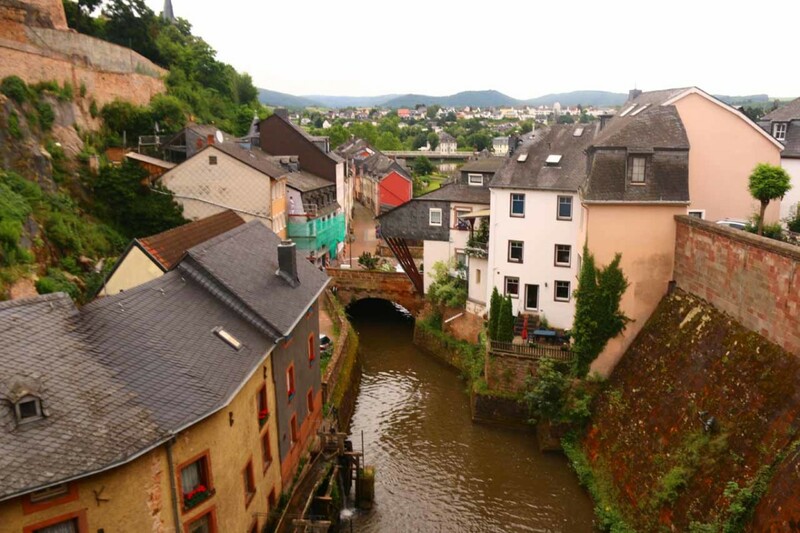 From the car park, we walked beneath the bridge supporting the L132 road, then we followed the narrow street called Staden through the lower extremes of Old Saarburg. 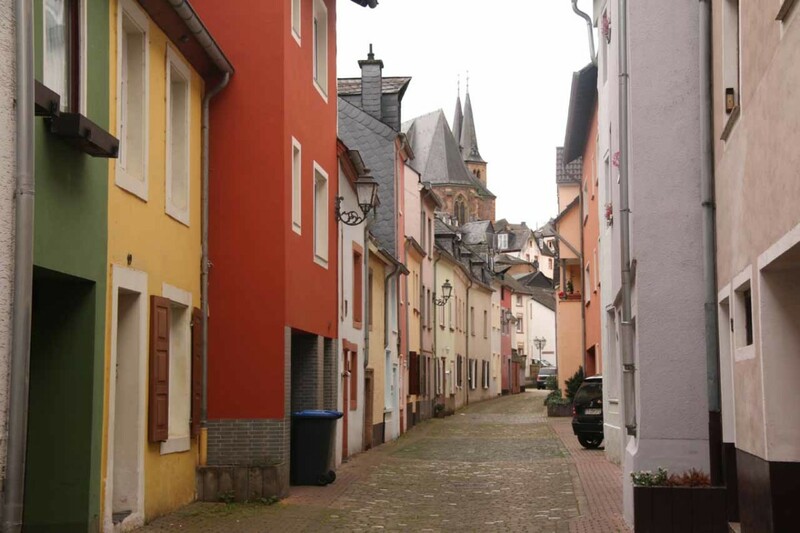 After roughly 200m along this relatively quiet street, we then reached a fork. 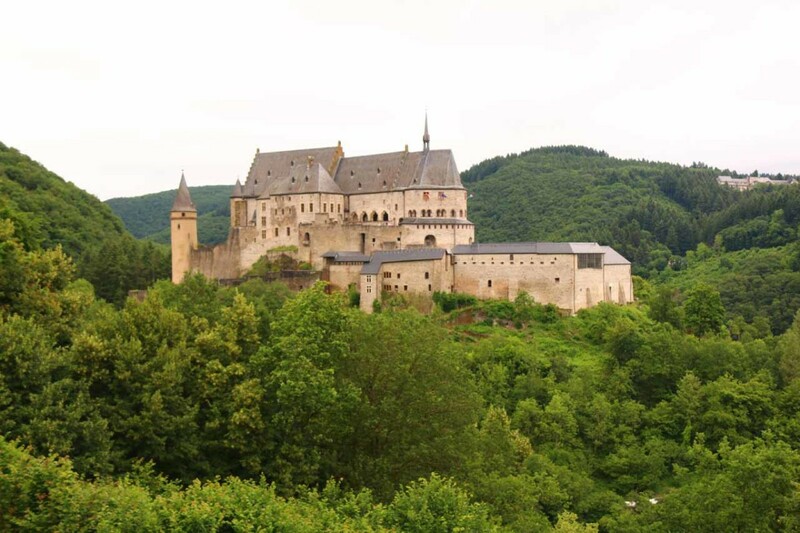 Keeping straight at the fork led us to a dead-end right a mill. Going left at the fork led us up a narrow, twisting, and sloping alleyway before we eventually arrived at an overlook about 50m or so up this climb. 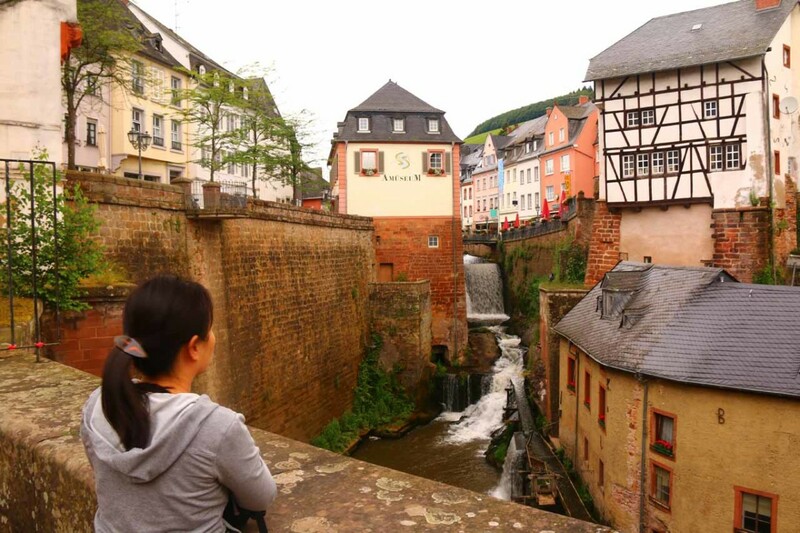 At this vantage point, we managed to get direct frontal views of the Saarburg Waterfall (like what you see above). 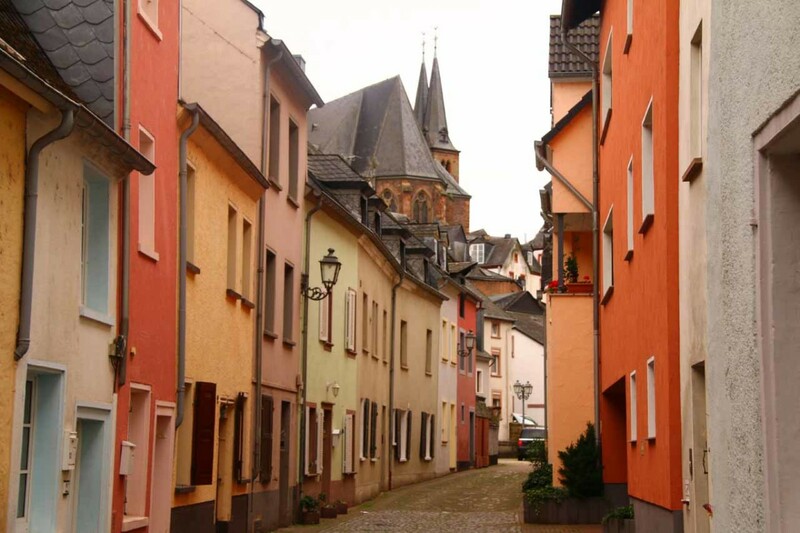 Continuing a few more paces up the sloping alleyway, we then arrived at a street junction near the Sankt Laurentius Catholic Church. 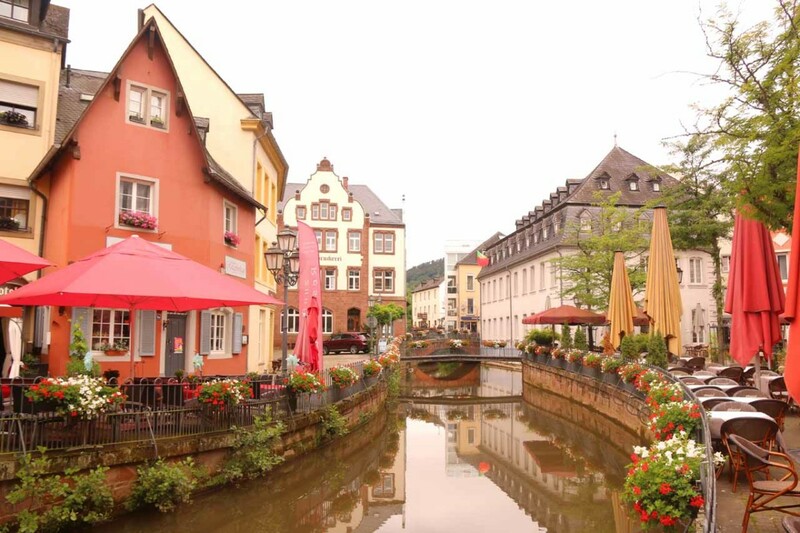 Keeping right at this junction, we followed the Leukbach further upstream while flanked by cute cafes and shops in what appeared to be the heart of the historical city. 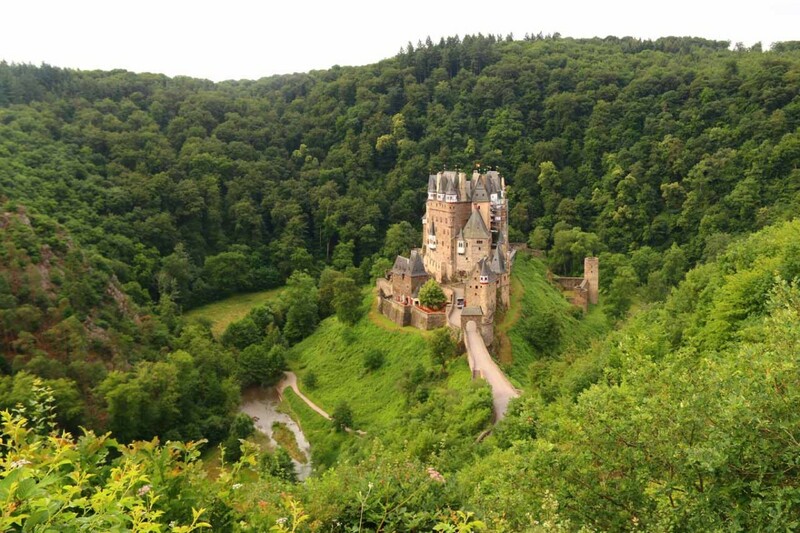 There were pedestrian bridges across the Leukbach, which allowed us to experience top down views of the waterfall from both sides. 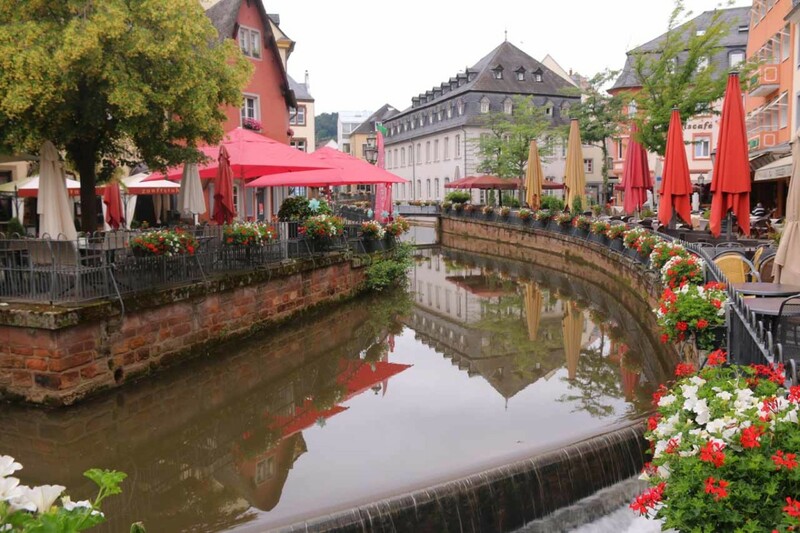 There were also more cafes and shops on the opposite side of the watercourse so one could relax and soak in the ambience of the historical center of the medieval city with the sounds of the waterfall itself. Overall, we spent less than an hour away from the car though it’s easy to spend more or less time here (possibly in less than 30 minutes) depending on how much time you’re willing to spend here. 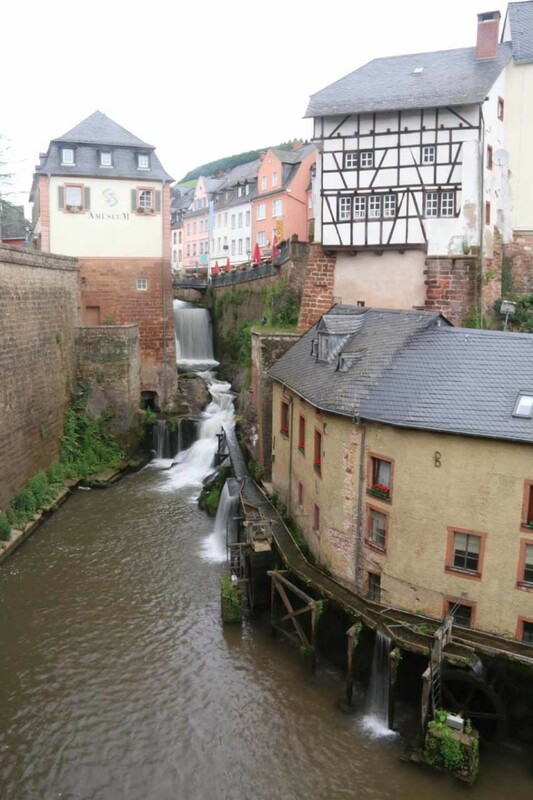 Finally, something that we noticed regarding German and Austrian waterfalls was that there tended to be many different spellings or pronunciations referring to what we’re calling the Saarburg Waterfall. 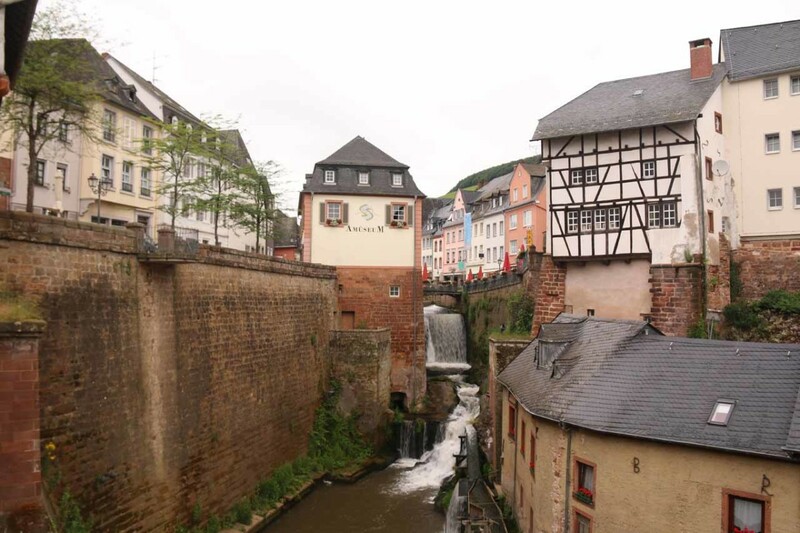 Thus, you might see the falls referred to as (der) Wasserfall Saarburg or Saarburg Wasserfall, which would be the way German speakers would refer to it. 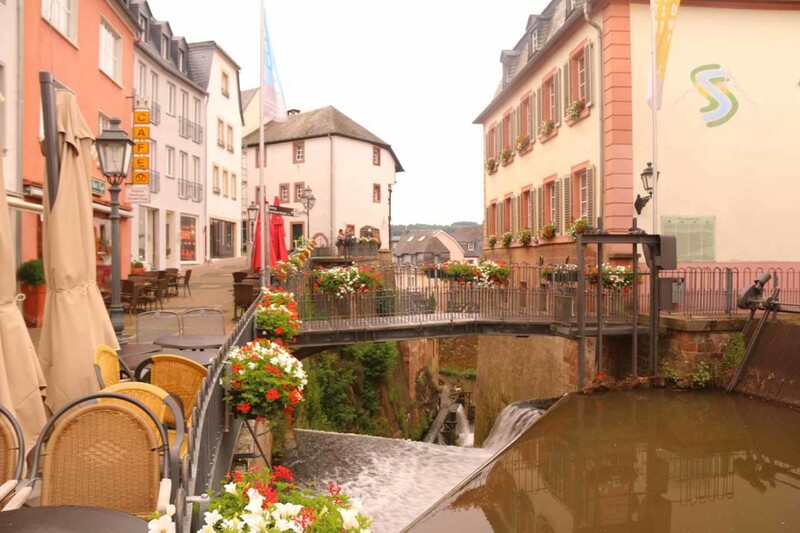 The Saarburg Waterfall is situated in the heart of the city of Saarburg. 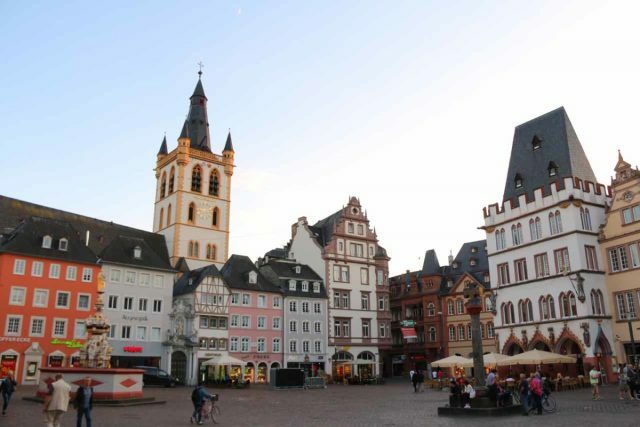 While there are many ways to reach this landlocked city, we’ll describe how we did it from the city center of Trier. 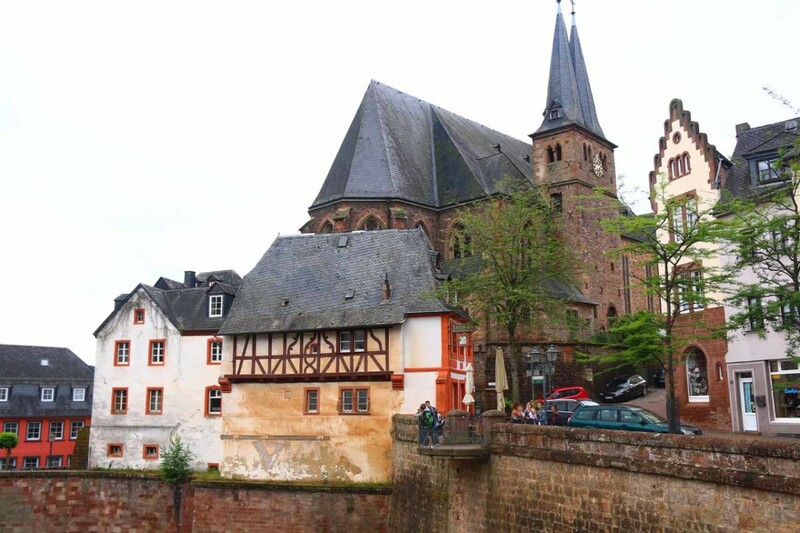 From the Trier Innenstadt (city center), we drove northwest along Nordallee then Lindenstrasse (or Lindenstraße) before turning left onto the busy B49 road along the Moselle River. It became the B51 after about 3km. From there, the most direct route would be to continue on the B51 for about 21km into the city of Beurig. 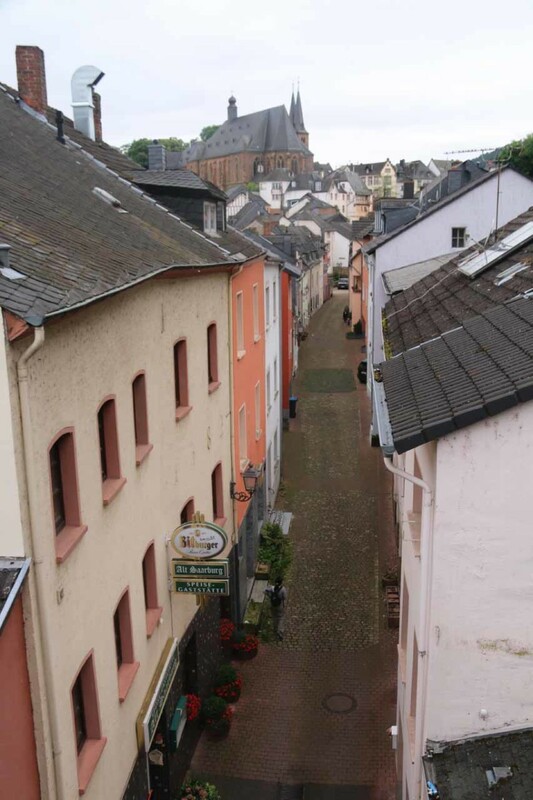 Approaching the bridge over the Saar River, we would then take the ramp on the right towards Guterstrasse (or Güterstraße). 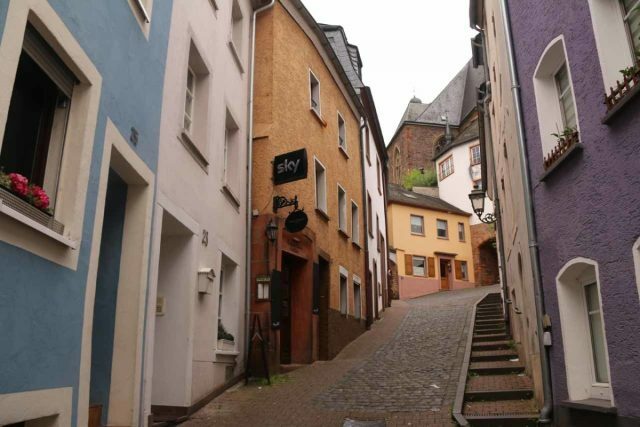 Once we’re able to do so, we’d then turn left onto Guterstrasse and follow it for 200m before turning left onto Bruckenstrasse (or Brückenstraße). 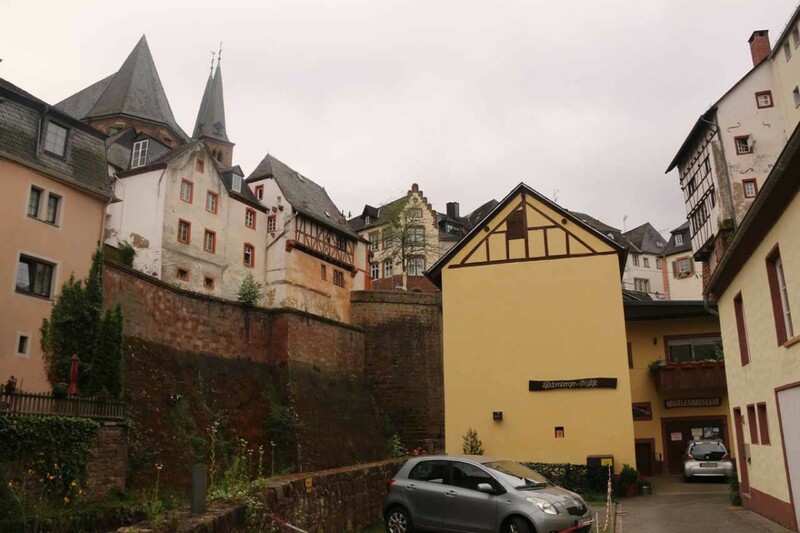 Then, we’d drive roughly 280m along Bruckenstrasse before turning right at the first opportunity immediately after crossing the Saar River but before entering the tunnel. 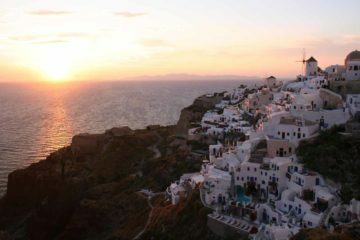 Once on the exit, continue downhill before turning right once again. 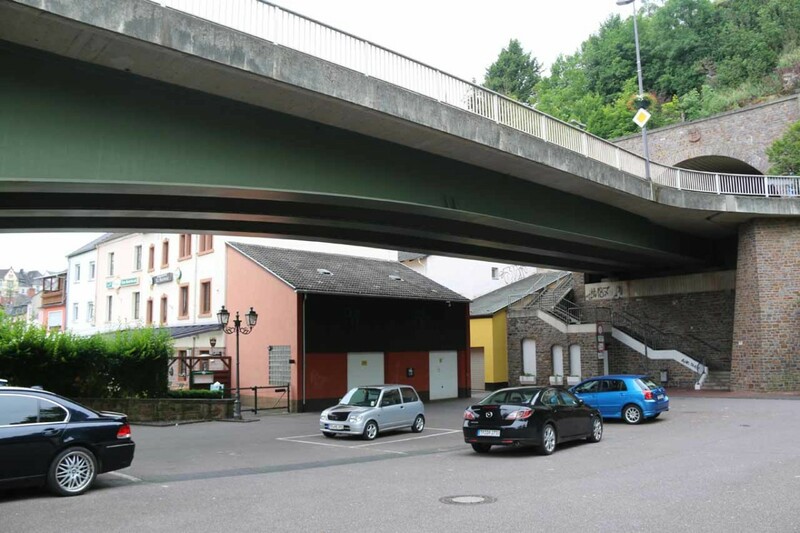 Then, as the road heads back towards the underside of the bridge, the car park will be on the left. We actually took a different route than the direct one described above. From where the B51 started and the B49 ended, we then continued on the B51 for another 10km. Then, we took the exit for Tawern and followed the K112 Road for about 6km to its junction with the L135 Road. Turning left onto the L135 Road, we then kept on this road for the next 5km as we entered the town of Saarburg. 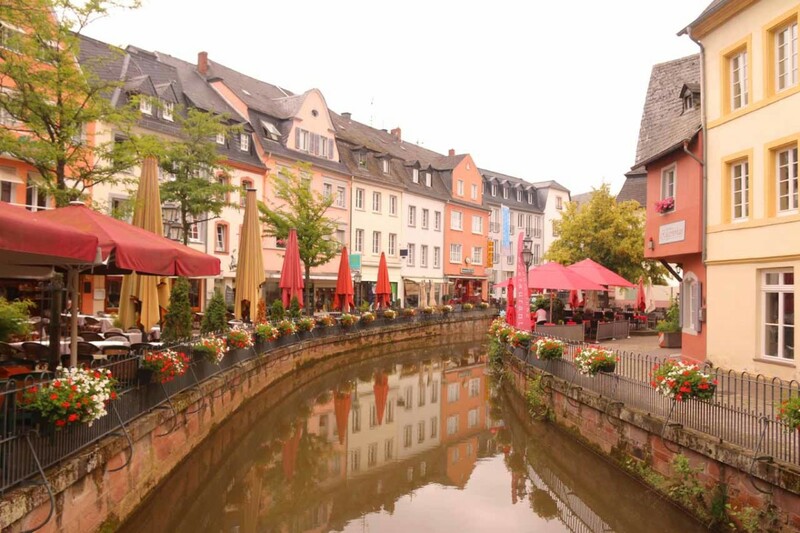 At the roundabout, the GPS then had us take the second exit (instead of the third exit which would have been better; more on that later) towards Auf dem Graben. 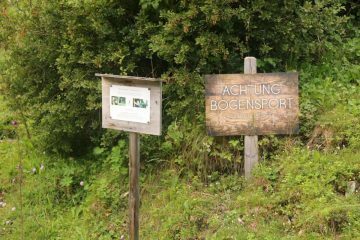 We then followed Auf dem Grabel for about 150m before turning left onto Kunohof (which seemed to be a restricted traffic area, but since we were early enough, I guess we managed to drive through it without difficulty). 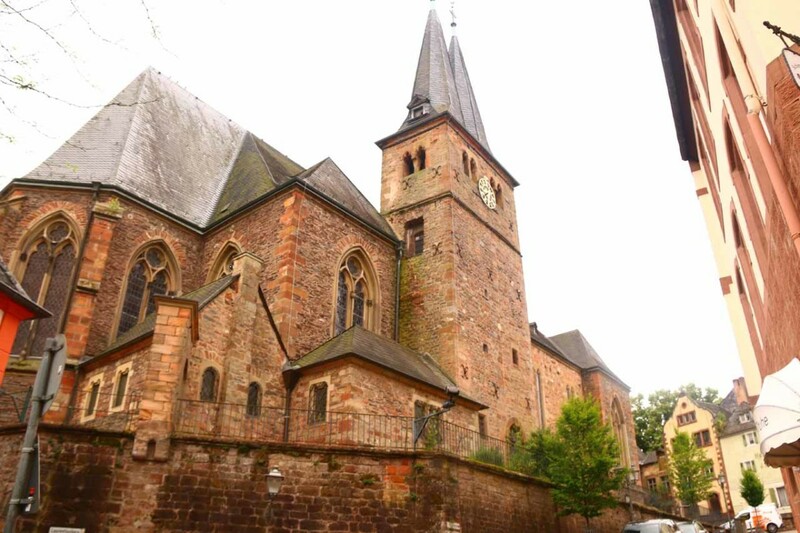 After about 100m, we then turned right onto the narrow sloping alleyway by the St Laurentius Kirchen (Laurentiusberg) where we then follow this narrow road for the remaining 250m to the car park on the right beneath the bridge. This drive from Trier took us about 40 minutes. 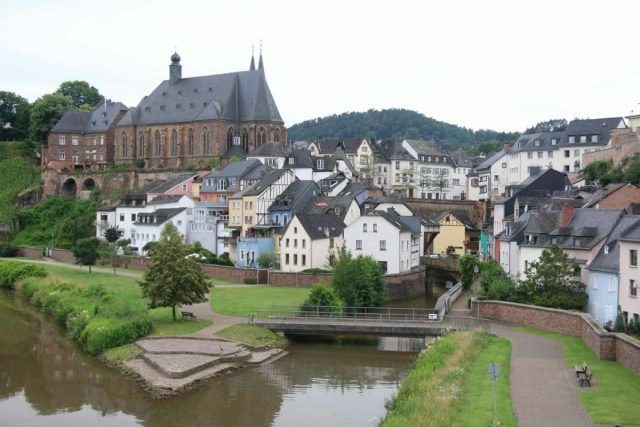 Now in hindsight, taking the L135 Road into Saarburg, we should have gotten off the third exit at the roundabout to get onto Graf-Siegfried-Strasse (Graf-Siegfried-Straße) and follow this road for about 400m to the next roundabout. Turning right at this roundabout, we’d then enter the tunnel and look for the exit on the left shortly after leaving the tunnel. Then, we’d descend the ramp and turn right to get to the car park beneath the bridge. Finally, for some geographical context, Saarburg was about 24km (under 30 minutes drive without traffic) southwest from from Trier, 46km (under an hour drive) east of Luxembourg City, Luxembourg, 119km (under 90 minutes drive) southwest of Cochem, 151km (over 90 minutes drive) southwest of Koblenz, and 208km (2.5 hours drive) west of Frankfurt.